As many of my readers know, earlier this year we had to say goodbye to my beloved Puffy. This caused a few changes in our household. While some were natural, others were made by choice. One of the few changes I decided to make in Lilu’s life was to buy retractable leash to use in her long midday walks. Yes, those horrible leashes that many trainers and pet owners hate! A leash made of a thin cord that can extend 10, 20, or 30 feet. The cord is housed inside a plastic device with a handle and button that owners can use to control the length of the leash. If not handled properly, retractable leashes can be dangerous to the handler, the dog, and other people and dogs you meet when you’re out for your walk. The long wire can cause leash burn if the handler tries to grab it to hold on to the dog, or it can get tangled around the dog’s leg, causing pain and injury, as well. The longer leash can also put the dog in harm’s way. A dog is faster than a human’s reaction time, and therefore, by the time the handler tries to stop a dog who suddenly decides to chase a squirrel or rush up to an unfriendly dog, well… a lot of things can go dangerously wrong. There have been terrible stories of handlers and dogs getting seriously injured—sometimes permanently—in retractable-leash accidents. So you might understandably be wondering why I decided to walk Lilu with one. Lilu is only the fourth dog (in 13 years of dog training) I have ever used a retractable leash with. This is because I had a rigorous, if mostly subconscious, set of criteria that needed to be met in order for me to use this type of leash. The truth is, these leashes can provide freedom for some dogs and allow them to explore their surroundings during walks. It can also allow for training distance work, when the dog is ready to work at that level. When I decided to get one for Lilu, it was for two specific purposes on those midday walks: to let her explore more, and to practice coming when called from a distance. A little more cardio and a little more mental stimulation. Rather than writing about how bad and dangerous these leashes are (because they truly can be), I thought it would be more productive if I shared my criteria for using one. This tool is not a good fit for many—perhaps even most—dogs and handlers. Read the six criteria below, assess yourself and your dog honestly, and see if the retractable leash might be a good fit for your situation. And always remember that any tool you use needs to be both safe and positive. If your dog is pulling on the leash, giving him more leash will not stop the pulling. In fact, the opposite is true: adding more leash will increase the gap between you and your dog and decrease the chances of your dog being attentive. Proper leash walking is about your dog acknowledging your presence when you are both outside. The only way you can get this is through focus, and focus is the result of a strong relationship between you and your dog. Your dog needs to believe you are higher value (more rewarding, more fun, etc.) than anything else that might be outdoors. If you are his #1 value outside, then the gap between both ends of the leash can be increased. This rule takes most of my clientele out of the running. The purpose of giving your dog more leash is so he can enjoy the space parallel to your path (the grass and trees planted alongside the sidewalk). If there is no space around you, logically why would give them more leash? Most of my clientele live in Chicago’s South Loop—an area with limited sidewalk space but a virtually unlimited amount of stimulation in the busy streets. There are more reasons in this environment—safety being the primary one—to keep your dog close to you than to let him wander farther away. In addition to crowded sidewalks and busy streets, think of elevators, hallways, and all the other tight spaces that require you to keep your dog close to you. Dog Has a Great Verbal Cue System. Having a dog farther away with a leash that provides less control puts more pressure on the handler to guide the dog using verbal cues such as Wait (when approaching a street), Come (to get the dog to return to you quickly), and Leave It (to guide the dog away from distractions). While it is possible to lock the retractable leash to prevent the dog from pulling it out to its full length, doing so can actually harm the dog—and you. Imagine your dog running towards the end of the leash, gaining momentum as he goes, expecting to be able to run for 10 or more feet before reaching the end of the leash. Mid-sprint, you suddenly lock the leash, causing your dog to come to an abrupt halt, jarring both his body and yours violently. Ouch! Ouch for the dog (especially if the leash is attached to a collar rather than a body harness), and ouch for your shoulder. It doesn’t take many such experiences to cause the dog to be on edge when being walked. If the dog is able to respond to verbal cues, you can guide him safely out of harm’s way without the need to suddenly lock the leash or grab the wire. If your dog is sensitive to noises, tends to bolt for things, is a strong puller, and/or weighs more than about 30 pounds, this is not the leash for you! A noise-phobic dog can become dangerously scared of the noise caused by the leash being fed out or retracted, or by the noise of it clattering behind him if he bolts and you drop the leash. Strong dogs can break the cord itself if they get enough momentum, and that momentum can also be enough to pull you off your feet and inflict serious injury. The only dogs I have used this leash with have weighed less than 30 pounds, had great self-control, and had no worries about unfamiliar noises. One of the most common reasons pet owners dislike the retractable leash is their negative experiences with other pet owners using them. The most common complaint is that dogs on retractable leashes rush past them on city sidewalks. I agree. Not every dog wants to be greeted while walking, and neither does every person. There are many legitimate reasons for this, all of which should be honored by anyone giving their dog more freedom. One of my personal rules while walking with Lilu is that she heels past other dogs or other people. If we see someone approaching, I call her name to get her attention, then cue her to heel. Once we pass by the distraction, she is allowed to have more freedom again. 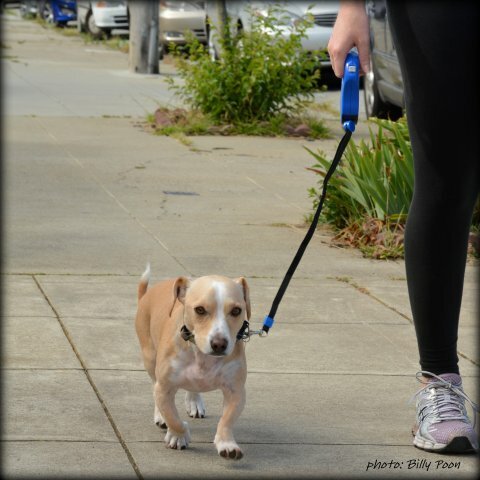 Dogs need to be flexible and have solid leash-walking manners prior to upgrading to more leash. This was the primary reason I never considered having Lilu on a retractable leash until recently. Puffy and Lilu really enjoyed taking their midday walks together; it was their longer walk of the day, and I loved that Puffy slowed both Lilu and me down in what I called our daily “detox/calm” walk. Both Lilu and I loved it, and even after his passing we continue to do our slow walk at this time, only now Lilu gets a longer leash. Using the leash while walking both dogs simultaneously would have been unenjoyable and unsafe, especially since Lilu was so young—I was afraid she would wrap herself around Puffy’s fragile body or somehow hurt him, and I knew my reflexes would be slower because I was focused on more than one dog. You cannot safely text, talk on your phone, drink your coffee, or even let your mind wander while walking your dog on a retractable leash! You need to stay very alert in order to keep everyone safe. When I’m using this leash I am in training mode, and when I want to be a little more relaxed, I simply go back to using our normal, shorter leash. How did you do? Which criteria would challenge your dog the most? Remember that some of these criteria can be met through good positive training (having a great verbal cue system, for example), while others cannot (even the best training can’t turn a Great Dane into a Chihuahua, or make it safe to walk two dogs on retractable leads at the same time, or to walk even just one small dog while you text your sister or sip your latte). Always keep your dog’s safety in the front of your mind, and make sure that no training tool causes your dog pain or increases his fear.